Over the past few months I have been trying out the JOOLA Rhyzer rubber range. There are three rubbers – Rhyzer 43, Rhyzer 48 and Rhyzer Pro 50. This is a new series of rubbers by JOOLA designed to cope better with the 40+ plastic table tennis balls. In this blog post, I give a review of the three Rhyzer rubbers – how they differ, who they are suited for and whether they are any good (spoiler alert – I LOVE THEM!). I’ll start with Rhyzer 48. I have been using this as my forehand rubber for the past four months, so I have got to know it very well. It is an excellent rubber for playing topspin attacks. It’s super-easy to topspin pushes and chops. The rubber grips the ball well and generates lots of spin. I’m able to get these topspin attacks deep on the table with high consistency. It’s the best rubber I have ever used for counter-topspin close to the table and mid-distance. The combination of grippy rubber and medium throw makes it a joy to counter-attack other player’s attacks. This area of my game seems to have gone up a level since I have been using Rhyzer 48. Maybe I have improved my technique, maybe it’s the rubber or probably a bit of both. Blocking and pushing are fine, but you need good technique with these strokes to control the ball – otherwise the ball will pop up or fly off the end of the table. But Rhyzer 48 isn’t really the sort of rubber you want to use if you’re a pusher/blocker. It’s definitely best suited to an attacking topspin game. Over the past 5 years I have used either Butterfly Tenergy 05 or Tibhar Evolution MX-P on my forehand. I prefer JOOLA Rhyzer 48 to both. It has a lower throw than Tenergy 05, so I’m able to keep more balls on the table. And it’s as fast as Evolution MX-P, but I can generate more spin. I think Rhyzer 48 will be my forehand rubber for some time to come. Summary: JOOLA Rhyzer 48 is an excellent forehand rubber. It’s ideal for an advanced attacking player who likes to topspin close to the table or mid-distance. It could also be used as a backhand rubber if you mainly play an attacking topspin game. I have been using Rhyzer 43 as my backhand rubber for the past four months. It’s not as fast as Rhyzer 48 or Pro 50. It still has plenty of speed, but it’s just a bit more forgiving. It’s a little safer. The spin generation is still very good. I am able to execute backhand flicks and backhand topspins (even with my slightly dodgy technique!). Whatever JOOLA have done with the rubber / sponge combination, it does make it easy to grip and spin the ball consistently. So I play these shots with confidence, knowing the rubber is going to do its job. It’s just down to me to get the technique right. Pushing is ok, but you do need good pushing technique to get the most from this rubber. If I’m too passive with my push, the ball will pop up. But if I get the brushing contact right, I can really generate lots of backspin. The biggest strength of Rhyzer 43 for me is blocking and counter-hitting. I spend a lot of time blocking when I’m coaching and it is very easy to control the ball, even the heavy topspin attacks. When I play competitively, I’ll use my backhand counter-hit more. Because Rhyzer 43 has manageable speed levels, I can hit with my backhand quite hard and still keep the ball on the table. I don’t overhit too many times. Previously, I have used Butterfly Tenergy 05 FX, Butterfly Tenergy 64, Yasaka Razka 7 and Yasaka Razka 9 on my backhand. I much prefer Rhyzer 43 to the Butterfly rubbers. Much more controllable, but equally as spinny. And it just about has the edge over the Razka rubbers – similar speed, more spin and better suited to the 40+ plastic balls. 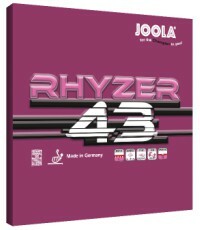 Summary: JOOLA Rhyzer 43 is an very good backhand rubber. It’s ideal for a player who likes to mix up play – topspin, counter-hit, push, block. It does everything pretty well. It could also be used as a forehand rubber for an intermediate player who wants to experiment with a faster rubber, but is not quite ready for Rhyzer 48 or Pro 50. I’ve played with Rhyzer Pro 50 less than the other two Rhyzer rubbers. This is mainly because the throw is lower (see diagram below), which doesn’t really suit my style of play. But it’s a very good rubber for the right player. One of the players at our club, Martin Gray, (ex-top 50 player in England) has been using Rhyzer Pro 50 since the summer and he’s a big fan. This rubber is fast! Very fast. And it has a lower throw than Rhyzer 43 and 48. So it’s very good for topspin-drives and hits low over the net. When I play with Martin, his direct attacks are very difficult to return. The ball comes fast. It comes low. And it has lots of spin. From my experience, I found Rhyzer Pro 50 very good to serve with and also good at the short game (touches and positive pushes), as you would expect from a lower throw rubber. It’s easy to keep the ball low over the net and tight to keep your opponent under pressure. I didn’t find blocking with Rhyzer Pro 50 as easy as Rhyzer 43 or 48, but again this is mainly because I have a more passive blocking style and prefer a slightly higher throw. But if you have a more aggressive blocking style, then Rhyzer Pro 50 should work really well for you. 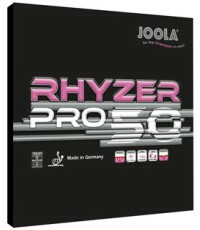 Summary: JOOLA Rhyzer Pro 50 is a high quality rubber for for advanced players with a direct style of play. It’s ideal for an attacking player, who likes to topspin-drive, hit and power-block with a lower throw rubber. Which blade should you use? I have done all my testing using a JOOLA Fever carbon blade. I’d describe this blade as medium-fast. It’s an offensive blade, but controllable. It seems to work well with the Rhyzer rubbers. I have seen other reviews which say the Rhyzer rubbers are very fast, possibly too fast. But I have not really found this to be the case. Maybe because my blade is medium-fast it makes the rubbers a little easier to control. So my recommendation would be to use or medium or medium-fast blade with these Rhyzer rubbers. I’m sure they’ll also work fine with a super-fast blade if you have the technique to handle it! I have been using Rhyzer 48 and 43 for four months. In that time I have played a lot of table tennis (mostly coaching). Probably 20-25 hours per week. You know what? The rubbers are still in pretty good shape. They are still gripping the ball well and generate lots of spin. So far, so good. They seem to be pretty durable. 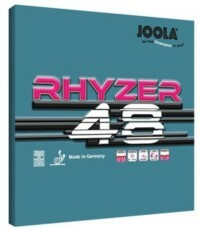 The JOOLA Rhyzer rubber range is as good as anything else I have used. I would even go so far as saying Rhyzer 48 is the best forehand rubber I have ever played with. Counter-topspin is just brilliant. And the ‘tocking’ sound it makes is joyous to hear! I really hope the Rhyzer rubbers take off and become more popular because they deserve to. At the moment, I’m not aware of that many people using these rubbers. So my recommendation is to get there early. Try them out and see if they work for your game. If you have a similar experience to me, you’ll be attacking with more speed, spin and consistency than ever before. If you’re in the UK, you can buy from Bribar or Amazon. If you’re in the USA, you can buy from Megaspin. Hi Tom my name is Chuck hewitt I live in Kings Lynn Norfolk I have been doing coaching in kings for around 40 years I am know just on 69 years young and thinking of retiring from coaching to try ànd concentrate on my owen game as it has been up and down so far this season. Do you have any of the Rhyzer rubbers that you have tryed left that you could send to me so I could try them before I lay out a lot of money on them just in case they don’t suit my game I like to top spin both forehand and backhand when I am playing. I look to forward to hearing from you. Many thanks in advance. I haven’t got any at the moment, but I’m sure I will do in a couple of months when I get some new ones, if you’re happy to wait? Could you please talk about Joola Golden Tango PS and compare it with Rhyzer 48 and 50? Tom I use ten 05fx on my fh, but i might like to try something else, i don’t like really hard rubbers – would you recommend the rhyzer 43 in that case? Yes, Rhyzer 43 is similar to Tenergy 05 fx. It could also be worth experimenting with Rhyzer 48. It doesn’t feel or play like a particularly hard rubber. Hello, I have used Rhyzer 48 on FH and 43 on my BH for about two years now. I had an instant crush from the first hits with these rubbers and that feeling has stayed fresh every time I go train. I’m going to test the 50 version on my forehand after this season because I’ve started to miss that little extra gear in the high end to get the ball really going fast. Might be a miss afterall my game leaped critically forward after changing to these rubbers, but I allways can change back to these “old” favorites of mine. This following is for Chuck. These rubbers must be really high tensioned on the factory because after you take the rubber off it shrinkens a few mm. And in my experience if you glue it again it has dramatically lost it’s magic. So it’s not for players who like to reglue their rubbers from time to time and to say these really don’t call for that. And for Simon. I have all wood 7-ply off blade and the 48 is not feeling that hard at all, rather medium, or particularly fast (depending what blade you are using) but has very wide range of control, speed and character for allround offensive style of play. I feel these rubbers very effortless to play with.